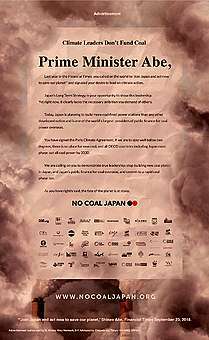 Greenpeace Japan acknowledges today’s announcement from Idemitsu Kosan, Kyushu Electric, and Tokyo Gas to abandon plans to build a coal plant consisting of two units in Sodegaura, Chiba. The announcement to cancel coal project development is consistent with trends that are currently happening in Japan and worldwide. Within the past year, several coal projects have already been cancelled in Japan. However, in consideration of long-term sustainability’s perspective, Greenpeace Japan has been requesting the developers to shift to renewable energy instead of investing in another fossil fuel, LNG. 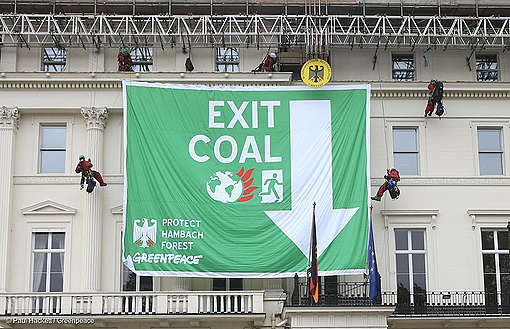 “The decision to move away from coal is positive, and the only justifiable decision in light of Japan’s commitment to Paris Agreement as well as last year’s IPCC 1.5 report’s findings. However, the alternative solution proposed by the developers is not a solution at all. The message from climate science is clear: to avoid ever worse impacts of climate change, such as extreme weather events witnessed in the recent years, there’s simply no space for any new fossil fuel based power plants, not even gas. What is needed is an urgent shift and investments in energy efficiency and sustainable renewable energy” said Ayako Sekine, Energy Campaigner of Greenpeace Japan. The original plan of the three companies was to build a coal plant of 2GW capacity, but according to the companies’ announcement, the economic outlook of the project was not positive enough. This shows that the gap between conventional energy business model and the financial environment, given the reality of climate change, is increasing. The Sodegaura coal project has been criticized by civil society, including a group of local citizens, Kiko Network and Greenpeace Japan. During the last years, the groups have repeatedly requested the utilities to stop the project. The groups have for example held meetings with the developers, produced research about the expected air pollution emissions and health impacts of the project, launched petitions for the cancellation of the project, as well as published research on the community’s opinion of the project. Most recently, Germany announced the country’s phase-out target, including a mechanism for reviewing and updating the target for more ambition. Several other European countries have already set phase-out dates ranging from 2015 to 2030. While utilities in Japan have started making logical moves to protect themselves from stranded assets risk, the government’s current energy policies are quickly becoming more and more outdated. “For Japan to have credibility in global climate and energy politics, and the businesses to be sustainable, other coal projects should follow the example of cancellation like the one for Sodegaura today, with the long-term perspective based on climate science and the risk analysis. This is an urgent task for utilities, the project’s funders and the government.” says Sekine.